It's interesting blogging for Army, as I usually have to tone down any boisterous smacktalk since Army hasn't been very very good at football since the internet was invented. Being the low man on the D-1A blogging totem pole gives one a certain humility that you might not get if you were blogging a team like, say Florida for instance. Since getting kicked out of the Big East joining the MAC Temple has reclaimed its mojo not in small part by hiring Penn State homeboy Al Golden. Al Golden was a fantastic hire for Temple; I mean how often is it that a program can hire a member of the Jersey Shore Sports Hall of Fame? Lofty accolades aside, Golden has the Owls at 3-2 and poised to take the MAC East. Being a humble Army Black Knights blog, it's way beyond me to post some trite ish, like "Wow! Temple actually has a blog?!" No, I'm sure The Unbalanced Line has that market of incredulous onlookers covered. I am however very surprised about how Temple Football Forever lets fly with this nugget. People who watched Temple practice in the summer came up with one name. It's what I thought when I saw Pierce for the first time in the Villanova game. Dickerson was the kind of guy who would approach the hole, take about a half-second to mull his options against the defense, then attack the weakest part of it. 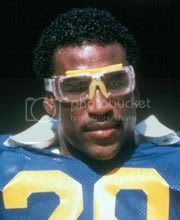 So, I thought, that pretty much was Pierce, a modern-day Eric Dickerson. I thought me and the other Temple fans were the only ones who thought that until I heard the Buffalo announcers. "He kind of reminds you of Eric Dickerson," one of them said during the Owls' 37-13 win three weeks ago. Then the Eastern Michigan announcer said the same thing. "He runs like Eric Dickerson," he said. We're all in agreement then. There is a new Eric Dickerson and he runs the football for Temple University. Bernard Pierce is the new Eric Dickerson. Really? The obvious flaw in that comparison is that Pierce played his 3 games against Buffalo, Eastern Michigan and Ball State three MAC non-power non-houses that have a combined 1 FCS win between the three of them. Army isn't Texas, and I'm not going to pretend they are - but the Knights are certainly above the level of winless Ball State and Eastern Michigan. In fact the Black Knights have proved so much on the field. Unless Freshman Pierce wears Eric Dickerson goggles fitted with a dual laser, his streak of 100 yard games will end Saturday at Lincoln Financial Field. Moving on... Sal Interdonato over at Varsity 845U is talking bowl game. If Army wants to achieve 6 wins and gain a bid to the Eaglebank Bowl they will have to win its winable games. The Temple game - Eric Dickerson or not... falls in the winable category.